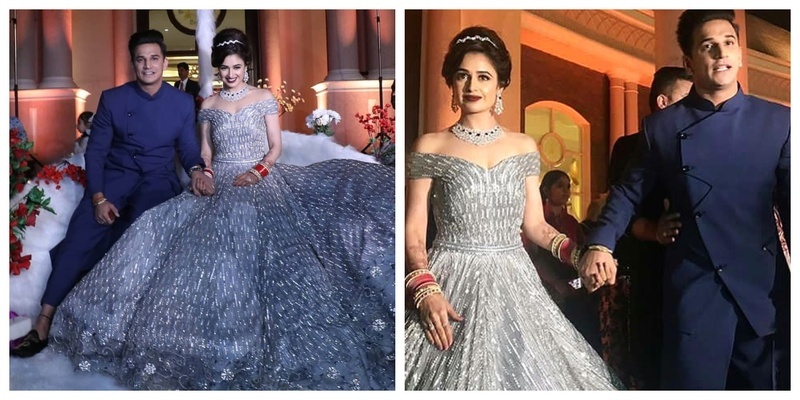 Prince Narula and Yuvika Chaudhary’s Chandigarh Reception looks right out of a Fairytale! Prince Narula and Yuvika Chaudhary got married on October 12, 2018 and and have been taking the internet by a storm since then. Right from their Bigg Boss days to now as a newly-married couple, #Privika have been giving some major relationship goals to all other couples out there and looks like there’s no stopping them. And right when I was recovering from their wedding festivities, the couple hosted a lavish reception at Prince’s hometown - Chandigarh and have caused quite a stir since then. The event was all about grandeur and jazz and everything that the couple is about - LOVE! While Prince opted for a dapper cobalt blue kurta, Yuvika looked every bit of a princess in the larger-than-life and heavily embellished silver gown. She wore her hair in a bun and finished the princess look with a tiara. Their wedding reception was a perfect fairytale as the two entered the venue in a royal chariot adorned with colourful flowers and faux fur. Well well, here’s wishing this newly married couple a lifetime of togetherness!